"Mascarpone is an Italian cheese with a delicate, fresh smell that lightens up all dishes. And this appetizer is so deliciously sweet and simple you would wonder why you haven't had it before." Cut both ends off onions and place onto a baking sheet. Roast in preheated oven until centers are soft, about 15 minutes. Remove, and let onions cool. Reduce heat to 350 degrees F (175 degrees C). Peel onions and remove center core leaving 1/2 inch outer shell intact. Mince the center flesh and place in a bowl. Combine with mascarpone cheese, garlic, shallot, and thyme. Fill onion shells with cheese mixture and replace onto baking sheet. Bake until the surface of the cheese bubbles, about 10 minutes. Serve hot. The presentation is gorgeous, but the taste is lacking. 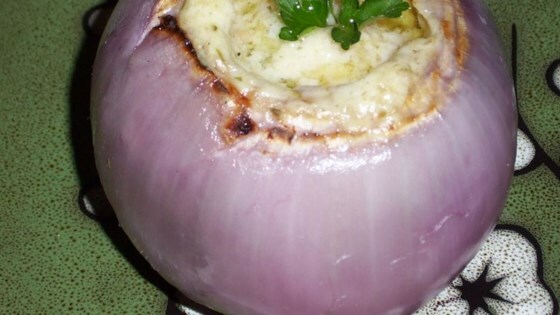 Even with a few more herbs in the mascarponse cheese, the filling had almost no taste. As written, I wouldn't make this recipe again.